All cis-acting frameshift signals encoded in mRNAs are minimally composed of two functional elements: a heptanucleotide “slippery sequence” conforming to the general form X XXY YYZ, followed by a RNA structural element, usually a H-type RNA pseudoknot, positioned an optimal number of nucleotides (5 to 9) downstream. Mechanistically, the ribosome is stalled on the slippery sequence by the pseudoknot structure in 3'. In about 10% cases, the ribosome will backtrack one nucleotide, creating one or more mismatchs between tRNAs and mRNA. 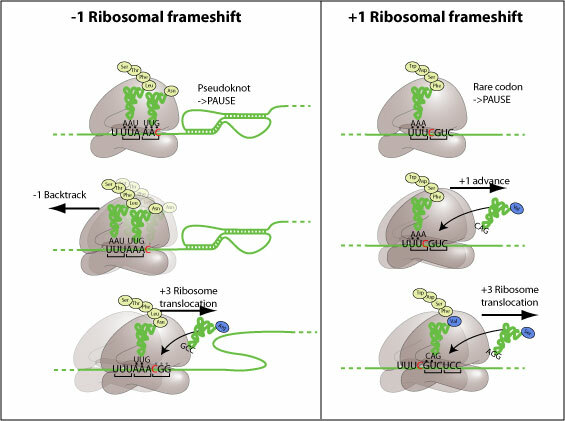 Translation resolves on the backtracked ribosome in the -1 frame. This frameshift is mechanistically different from the -1. The ribosome stalls on a slippery sequence, making a long pause at a rare codon for which few tRNAs are available. This long pause can be resolved by a movement forward of one nucleotide, creating one or more mismatchs between tRNAs and mRNA. Translation resolves on the advanced ribosome in the +1 frame.